Context: It is important to develop new therapeutic materials that have requisite clinical actions, are safe and economical. Aims: This study aims to histologically evaluate curcumin, an extract of turmeric (Curcuma longa) as a pulpotomy agent in rat molars and to compare it to mineral trioxide aggregate (MTA). Settings and Design: Animal study. Subjects and Methods: Twelve Wistar-Albino rats were randomly divided into two groups of 6 each. Pulpotomies were performed on caries free maxillary first and second molars on both sides of the arch, with MTA and curcumin (24 teeth each), respectively. Access cavities were sealed with resin-modified glass ionomer cement. Postoperative histological evaluation of pulpotomized teeth in both groups was done at 7, 14, and 30 days under a light microscope (×10). Statistical Analysis Used: Data were evaluated with Freidman's test and Mann–Whitney test at 0.05 level. Results: (a) There was a gradual reduction in inflammatory cell response in both groups across time periods tested (MTA P = 0.074, curcumin P = 0.039). (b) The overall architecture of pulp was maintained better in the curcumin group across all time periods tested (P = 0.368). (c) Dentinal bridge formation was consistently seen across time periods tested in MTA group (P = 0.9094) and was feeble in curcumin group (P = 0.9094) across time periods tested. Conclusions: Curcumin has been shown to have wound healing properties. It has the potential to be developed into a predictable and cost-effective vital pulp therapy medicament. The rationale of pulp therapy in primary dentition is that the tooth should remain in the oral cavity in a nonpathological and healthy state. Pulpotomy is performed in a primary tooth with widespread caries, but without confirmation of radicular pathology when caries excavation results in a pulp exposure. The coronal pulp is amputated, and the orifice of vital radicular pulp tissue is treated with a medicament that will encourage healing and safeguard the vitality of the tooth. The intent is that radicular pulp should remain healthy without unfavorable clinical signs or symptoms such as pain, tenderness or swelling, and also with no postoperative radiographic evidence of pathologic internal or external root resorption and no harm to the erupting permanent tooth, so that the primary tooth fulfills its role in the dentition. Mineral trioxide aggregate (MTA) is a contemporary material used for pulpotomies with a high rate of success. One of the drawbacks of this material, however, is its high price. Although numerous medicaments are available for pulpotomy, it is important to investigate new alternatives that could also present requisite biological and biochemical properties, be safe and easy to handle and have low cost. Traditional medicine is a wonderful resource for new medicines. One medicine in that category is turmeric (Curcuma longa) which belongs to the ginger (Zingiberaceae) family. Components of turmeric are called curcuminoids, which comprise mainly curcumin (diferuloylmethane), demethoxycurcumin, and bisdemethoxycurcumin. Curcumin, a yellow colored phenolic compound, is the most significant fraction which is responsible for the biological actions of turmeric. Extensive research studies have established that curcumin has antioxidant, antibacterial, antifungal, antiviral, anti-inflammatory, antiproliferative, and proapoptotic effects., Curcumin is an attractive agent to investigate further as it possesses desirable therapeutic effects, pharmacological safety, and small cost. The action of curcumin has never been reported for therapeutic uses in pediatric endodontic therapies. Keeping in view its potent wound healing properties, the present study was intended to histologically evaluate curcumin as a pulpotomy medicament and compare it with MTA in rat teeth. Twelve caries free Wistar-Albino rats, 8–16 weeks old, weighing between 250 g and 300 g were used in this study. The clearance for animal studies was obtained from Institutional Animal Ethical Committee. All rats were kept in a room with a constant temperature of 25°C ± 1°C and a 12/12-h light-dark cycle and fed rat chow (Uttam Agro Industries, Udupi, India) and water ad libitum. Twelve rats were randomly divided into two groups of 6 each. Pulpotomy was carried out in maxillary first and second molars on the right and left molars in each rat. In Group I (control), pulpotomy was performed in 6 rats (24 teeth) with MTA (Pro Root MTA, Dentsply, Tulsa Dental, USA); and in Group II (experimental), pulpotomy was performed in 6 rats (24 teeth) with 95% curcumin (Himedia Laboratories, Mumbai, Maharashtra, India). Before treatment, animals were anesthetized with 22–24 mg/kg intramuscular ketamine-hydrochloride (Aneket, Neon Laboratories Ltd, Mumbai, Maharashtra, India). Antisepsis of the oral cavity was achieved by rinsing with 0.2% Chlorhexidine digluconate solution (Hexidine, ICPA Health Products Ltd., Ankleshwar, India) for 60 s. Animals were positioned in dorsal decubitus and immobilized on a surgical table, and a holding device was used to maintain their mouths in an open position. Access cavities were carefully prepared in first and second maxillary molars with a round diamond bur (001/010 BR45, Mani Inc, Japan) and Endo safe end bur (ESE-014, SS White UK) under copious sterile saline irrigation (Marck Biosciences Ltd, Goa, India). Every effort was made to ensure consistency of the size of pulpal exposure. Pulpotomies were performed, after which pulp chambers were irrigated with sterile saline and gently dried with sterile absorbent paper points. In Group I (control), the orifices of radicular pulp were covered with MTA powder mixed with sterile water in the ratio of 3:1; and in Group II (experimental), orifices of radicular pulp were covered with 95% curcumin powder mixed with sterile water in the ratio of 3:1. Coronal cavities of teeth were then filled with resin-modified glass ionomer cement. Rats were sacrificed with an overdose of intramuscular Ketamine 7, 14, and 30 days' postoperatively. Following sacrifice, soft-tissue around the jaws was removed, and the treated teeth and surrounding tissue were retrieved using a surgical blade. Teeth and surrounding bone were placed in individual containers containing 10% formalin and labeled. Samples were stored in 5% nitric acid, and 20% saturated sodium citrate for decalcification. All teeth were prepared according to standard histologic techniques and embedded in paraffin. Six-micrometer-thick sections were cut with a microtome (Leica RM2245 semi-automated rotary microtome, Leica Biosystems, Germany) parallel to the main vertical axis of the tooth. Every 20th section mounted on glass slides and stained with H and E were blindly evaluated under a light microscope (Leica BM E educational microscope, Leica Microsystems, Germany) at ×4, ×10 and ×40 calibrated by oral pathologist according to the following criteria [Table 1]. Within each group, changes in the outcome at various time intervals (7, 14, and 30 days) was analyzed by Freidman's test. Interval-wise comparison of the difference in the outcome between two groups was analyzed by Mann–Whitney test. The level of significance was set at 0.05. Statistical Package for social Sciences was used for analysis of the data (SPSS for Windows, version 17.0, Chicago SPSS Inc., Chicago, IL, USA). The surgical procedure was well tolerated by the experimental animals, with no evident adverse effects occurring during an observation period of 7–30 days. There was a gradual reduction in overall inflammatory cell response scores within both MTA (P = 0.074) and curcumin (P = 0.039) groups across time periods tested (7, 14, and 30 days). However, for curcumin group, the reduction was statistically significant. Furthermore, on interval wise comparison between the groups, there was no statistically significant difference at all three time periods of evaluation [Table 2]. There was a gradual deterioration of soft-tissue organization scores in MTA group across time periods tested (7, 14, and 30 days) and the reduction was statistically significant (P = 0.006). The progressive change in the scores was not statistically significant in curcumin group. On interval wise comparison, MTA group showed higher soft-tissue organization scores (deterioration) compared to curcumin. The difference was not statistically significant at 7 and 14 days. However, curcumin group showed lower soft-tissue organization scores (indicating recovery) than MTA group at the end of 30 days. The difference was statistically significant (P < 0.001) [Table 3]. Dentinal bridge formation was consistently seen across time periods tested (7, 14, and 30 days) in MTA group (P = 0.9094). However, in curcumin group, dentinal bridge was feeble and continued to be the same across time periods tested (7, 14, and 30 days) (P = 0.9094). On interval wise comparison, there was a statistically significant difference between MTA and curcumin groups at 7 (P = 0.0014), 14 (P = 0.0009), and 30 (P = 0.0009) days [Table 4]. The amputation of the coronal portion of the pulp is an established procedure for treating both primary and permanent teeth with carious pulp exposures. The justification for this procedure is that the coronal pulp tissue, which is adjoining to the carious exposure, frequently contains microorganisms and shows evidence of inflammation and degenerative change. The abnormal tissue can be removed, and the healing can be allowed to take place at the entrance of the pulp canal in an area of essentially normal pulp. The placement of a medicament directly over the exposed pulp tissue is a recommended procedure to promote pulp healing and generate reparative dentin. If successful, this procedure precludes the need for more invasive, more extensive, and more expensive treatment. The purpose of this study was histological evaluation of curcumin as a pulpotomy medicament on the dental pulp of rat molar teeth and compare it with MTA at 7, 14, and 30 days postoperatively. There was no statistically significant difference in the inflammatory response between MTA and curcumin, curcumin showed better soft-tissue organization and MTA showed better dentin bridge formation at the end of 30 days [Figure 1] and [Figure 2]. Both MTA and curcumin groups showed moderate presence of polymorphonuclear leukocytes and mononuclear lymphocytes, dilated blood vessels at 7 and 14 days. However, inflammation completely subsided at 30 days. The inflammatory cell response of both groups was found to be comparable at the end of 7, 14, and 30 days. Inflammation is the crucial phase of the wound healing process. Uncontrolled inflammatory responses may lead to detrimental effects and subsequent tissue damage. Considering that tissue injury causes almost instantaneous onset of acute inflammation, controlling the process of inflammation is needed to optimize the wound repair process. MTA has very good biocompatibility; the pulpal wound treated with MTA are free from inflammation. Furthermore, MTA down-regulates the inflammatory cytokines CCL5, interleukin-1 alpha and interferon-gamma and may have an anti-inflammatory effect. Research shows curcumin, a highly pleiotropic molecule, can interact with several molecular targets involved in inflammation. Curcumin has been reported to possess potent anti-inflammatory, antioxidant, and immunomodulating activities. It is not surprising that, both MTA and curcumin were comparable in their anti-inflammatory activities. The overall architecture of pulp was maintained better in the curcumin group across all time periods tested. The fibroblasts were more dense and the odontoblastic layer maintained palisade pattern in most of the samples in the curcumin group across all time periods of evaluation. Fibroblasts were less dense, and the palisade pattern of the odontoblastic layer was not maintained in MTA group. The difference in the quality of pulp architecture was marked at the end of 30-day evaluation period. The infiltration of fibroblasts into wound site is essential for granulation tissue formation/tissue remodeling, collagen production, and deposition. Research studies have shown that MTA stimulates the proliferation of fibroblasts, cementoblasts, and osteoblasts. Curcumin enhances fibroblast migration, granulation tissue formation, collagen deposition, and in general re-epithelialization. Being apoptotic in the early phase of wound healing, curcumin eliminates unwanted inflammatory cells from the wound site. The reorganization and remodeling of the extracellular matrix are a necessity for wounds to completely heal. The extracellular matrix provides support to cells and is composed of various proteins and polysaccharides including granulation tissue and collagen. Transforming growth factor (TGF)-β is an important cytokine that is involved in the repair, chemotaxis, and deposition of collagen in a wound site. Curcumin improves wound contraction by increasing the production of TGF-β and therefore increasing fibroblast proliferation. Dentin bridge formation was more pronounced in MTA group and was insignificant in Curcumin group at the end of 7, 14, and 30 days' evaluation. One sign of a successful, vital pulpotomy is the occurrence of a “dentin bridge” at the location of pulpal amputation. It has been demonstrated that some kind of a stimulative chemical factor is essential for the development of protective reaction of traumatized dental pulp, where mere contact with biocompatible nonstimulative matter is not sufficient. 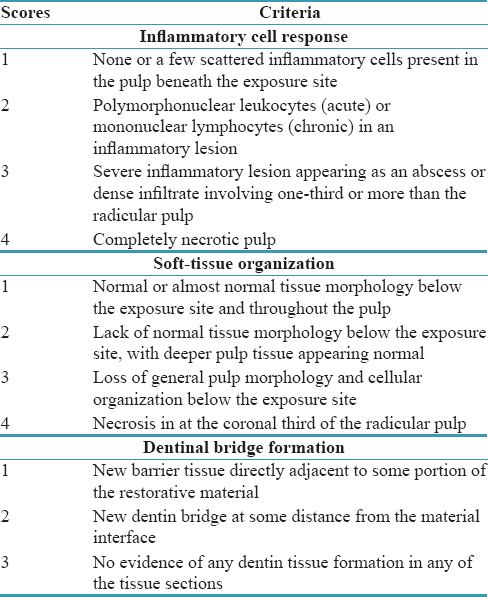 Studies have indicated that exposed pulp possesses an innate capability to produce dentin in response to operative procedures or trauma, irrespective of the agent applied to the amputation site. Nevertheless, successful pulp capping has been reported without the occurrence of a reparative dentin bridge over the exposure site. Although MTA is a more recent material used for pulpotomies with a high rate of success, it has some associated drawbacks related to handling characteristics and cost. There has been a remarkable advancement in the use of plants and plant extracts for medicinal use in recent years. The use of biocompatible substances has become a major area of interest in contemporary dentistry, particularly when direct contact with dental tissue is required. As a natural, biocompatible substance, curcumin can be considered a promising agent for use in the pulpotomy treatment of primary teeth. Curcumin makes a suitable candidate for topical applications, because of its low water-solubility. Furthermore, in an earlier study, curcumin has been shown to promote cell viability and induce proliferation of primary dental pulp fibroblasts. Long-term clinical, radiological, and histological studies are needed in large sample size to draw appropriate conclusions. A randomized controlled trial to confirm the findings of this study is underway. Based on the outcome, it may be considered that curcumin, with its excellent wound healing properties, is a promising biocompatible material for dressing the radicular pulp after pulpotomy. The observations of this study might help develop a predictable, safe, and cost-effective vital pulp therapy medicament. American Academy of Pediatric Dentistry. Clinical guidelines on pulp therapy for primary and young permanent teeth: Reference manual 2006-07. Pediatr Dent 2006;28:144-8. Aggarwal BB, Sung B. Pharmacological basis for the role of curcumin in chronic diseases: An age-old spice with modern targets. Trends Pharmacol Sci 2009;30:85-94. Jurenka JS. Anti-inflammatory properties of curcumin, a major constituent of curcuma longa: A review of preclinical and clinical research. Altern Med Rev 2009;14:141-53. Barbosa AV, Sampaio GC, Gomes FA, de Oliveira DP, de Albuquerque DS, Sobral AP, et al. Short-term analysis of human dental pulps after direct capping with Portland cement. Open Dent J 2009;3:31-5. McDonald RE, Avery DR, Jeffrey AD. Treatment of deep caries, vital pulp exposure, and pulp less teeth. In McDonald RE, Avery DR, editors. Dentistry for the Child and Adolescent. 9th ed. Missouri (UK): Mosby, Inc., Elsevier Inc.; 2011. p. 350. Hilton TJ. Keys to clinical success with pulp capping: A review of the literature. Oper Dent 2009;34:615-25. Akbik D, Ghadiri M, Chrzanowski W, Rohanizadeh R. Curcumin as a wound healing agent. Life Sci 2014;116:1-7. Okiji T, Yoshiba K. Reparative dentinogenesis induced by mineral trioxide aggregate: A review from the biological and physicochemical points of view. Int J Dent 2009;2009:464280. Barbosa Silva MJ, Vieira LQ, Sobrinho AP. The effects of mineral trioxide aggregates on cytokine production by mouse pulp tissue. Oral Surg Oral Med Oral Pathol Oral Radiol Endod 2008;105:e70-6. Paranjpe A, Smoot T, Zhang H, Johnson JD. Direct contact with mineral trioxide aggregate activates and differentiates human dental pulp cells. J Endod 2011;37:1691-5. Waterhouse PJ, Nunn JH, Whitworth JM, Soames JV. Primary molar pulp therapy – Histological evaluation of failure. Int J Paediatr Dent 2000;10:313-21. Rutherford RB, Wahle J, Tucker M, Rueger D, Charette M. Induction of reparative dentine formation in monkeys by recombinant human osteogenic protein-1. Arch Oral Biol 1993;38:571-6. Cox CF, Sübay RK, Ostro E, Suzuki S, Suzuki SH. Tunnel defects in dentin bridges: Their formation following direct pulp capping. Oper Dent 1996;21:4-11. Weiss MB, Bjorvatn K. Pulp capping in deciduous and newly erupted permanent teeth of monkeys. Oral Surg Oral Med Oral Pathol 1970;29:769-75. Dammaschke T. Rat molar teeth as a study model for direct pulp capping research in dentistry. Lab Anim 2010;44:1-6. 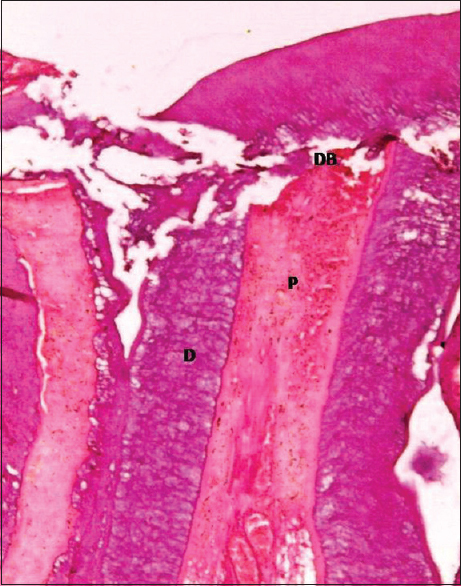 Dammaschke T, Stratmann U, Fischer RJ, Sagheri D, Schäfer E. A histologic investigation of direct pulp capping in rodents with dentin adhesives and calcium hydroxide. Quintessence Int 2010;41:e62-71. Kusum B, Rakesh K, Richa K. Clinical and radiographical evaluation of mineral trioxide aggregate, biodentine and propolis as pulpotomy medicaments in primary teeth. Restor Dent Endod 2015;40:276-85. Lima RV, Esmeraldo MR, de Carvalho MG, de Oliveira PT, de Carvalho RA, da Silva FL Jr., et al. 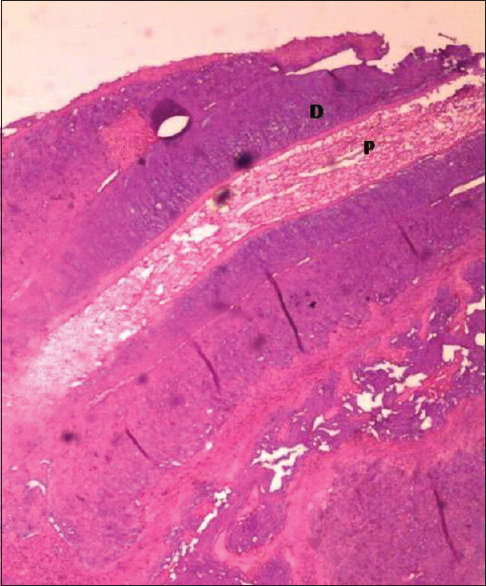 Pulp repair after pulpotomy using different pulp capping agents: A comparative histologic analysis. Pediatr Dent 2011;33:14-8. Mandrol PS, Bhat K, Prabhakar AR. An in vitro evaluation of cytotoxicity of curcumin against human dental pulp fibroblasts. J Indian Soc Pedod Prev Dent 2016;34:269-72.